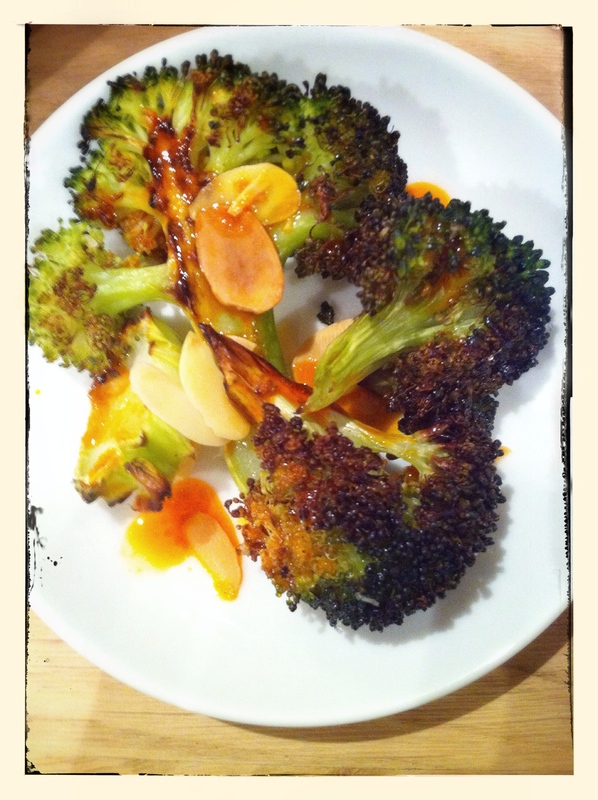 Roasting broccoli is a revelation – it intensifies the sweetness and gives it a little more earthiness. It is really delicious and my new favourite way to cook this superfood! 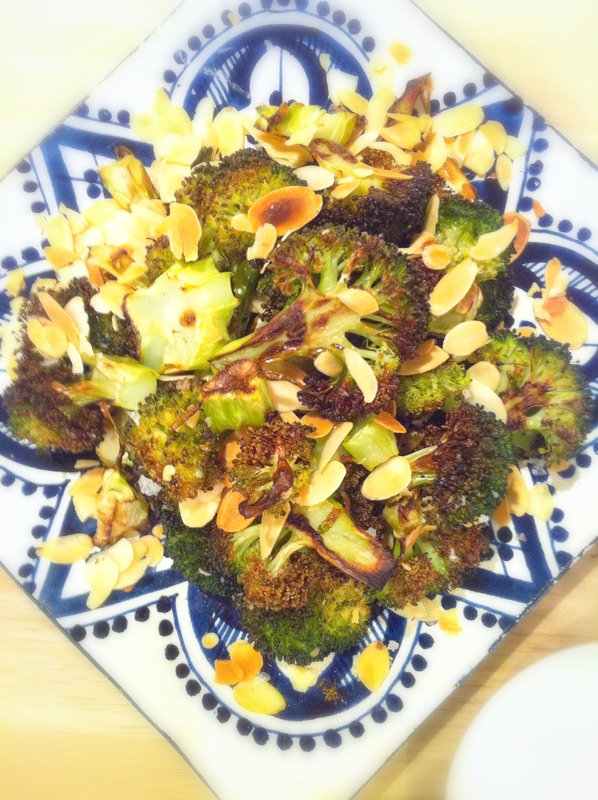 From what I can make out, Ina Garten (The Barefoot Contessa) brought this method to the attention of the general public with this lovely recipe for Parmesan Roasted Broccoli . The recipe that I have made has a more tapas feel about it, thanks to the tangy, smoky paprika dressing and some crunchy golden toasted almond flakes. 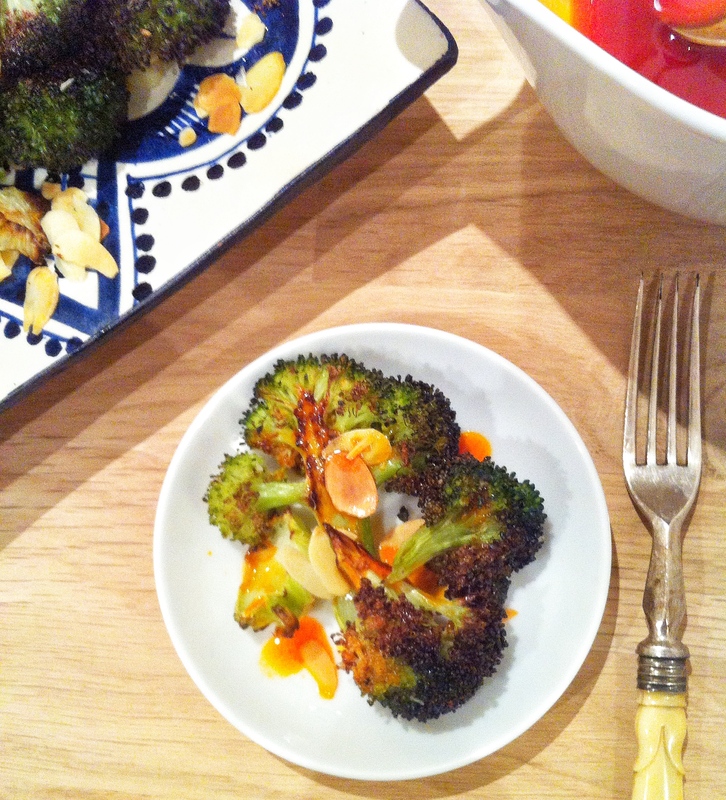 My version cuts back on the oil to boost the flavour of both the broccoli and the dressing. 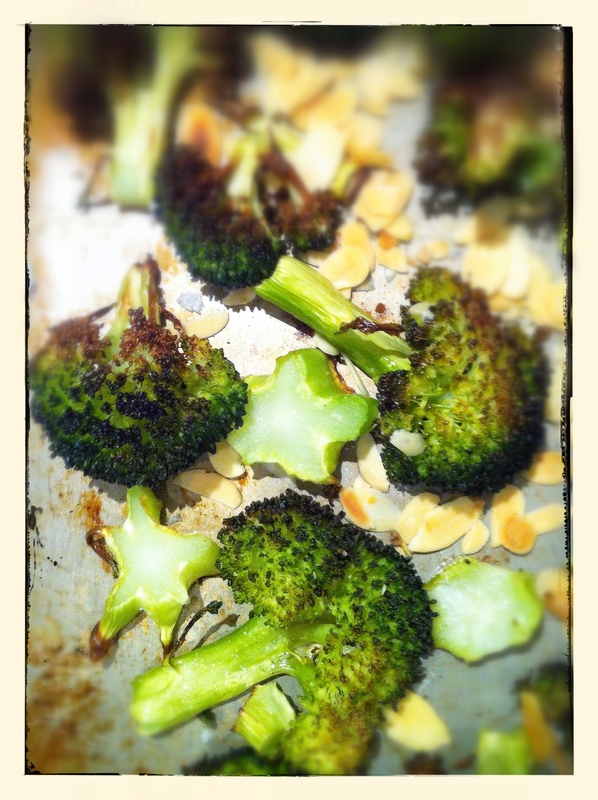 Cut the broccoli florets into bite sized pieces. 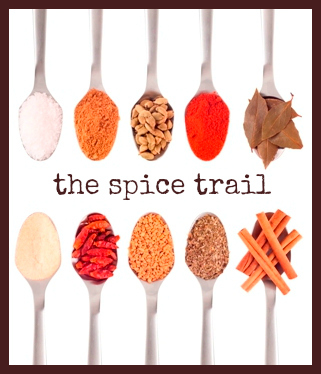 I am entering this recipe in the Spice Trail Challenge, hosted by Bangers and Mash. 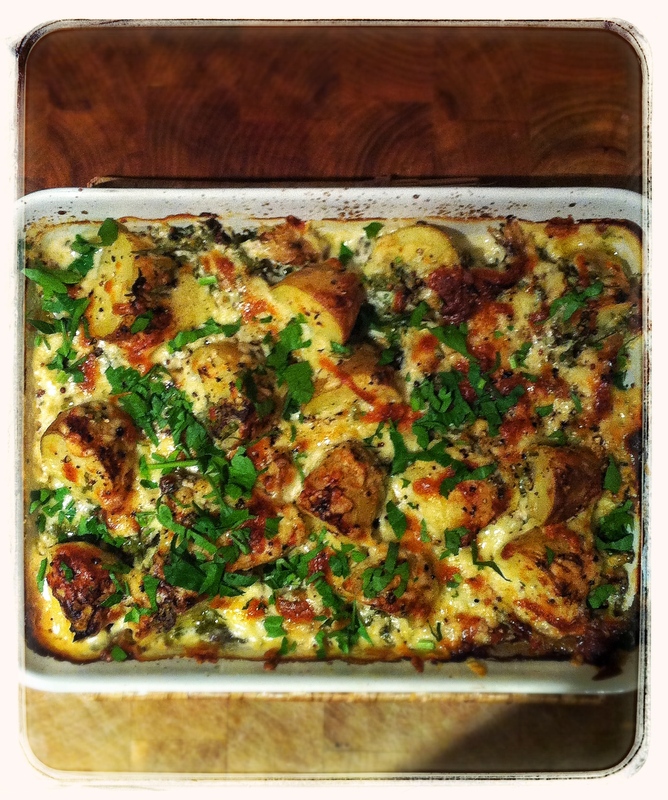 for January as it features Paprika – there are some wonderful recipes on there so do go and take a look at the entries. Get the dressing started as the longer it steeps the more flavourful it will be; heat the oil in a small pan for about 2 or 3 minutes. When the oil is warm (but not smoking as that will burn the garlic) add the crushed garlic and stir in the smoked paprika and take it off the heat. Let it stand for at least 10 minutes or as long as you can leave it. 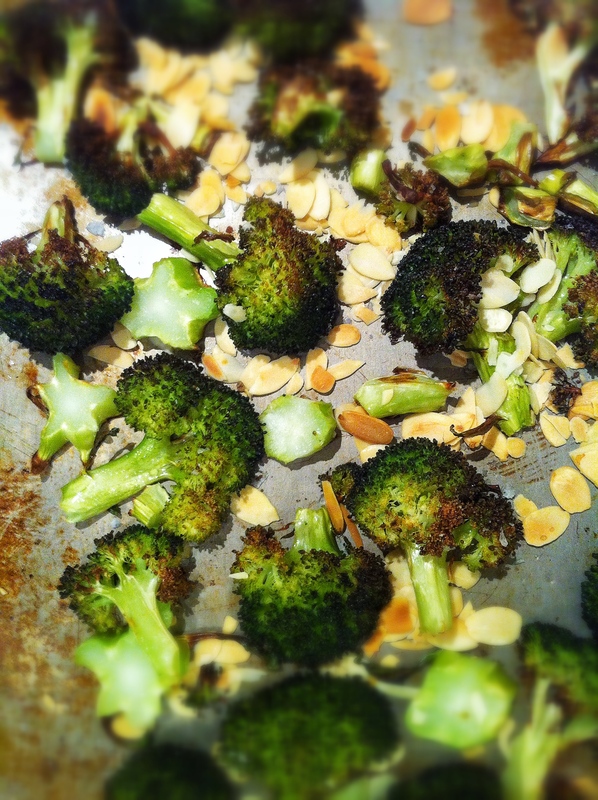 In the meantime, divide broccoli into bite sized florets, toss in a little olive oil and place on an oven tray. Sprinkle with a pinch of salt and roast in the oven for 20 minutes or until tender and with a few browned bits. Keep checking after 15 minutes to make sure that the florets are not burning to a crisp. Scatter over the almond flakes for the last 3 or 4 minutes to toast. When you are ready to serve, place the vinegar and salt in a small bowl and whisk in the flavoured oil, trying to leave behind as much of the solids as possible. 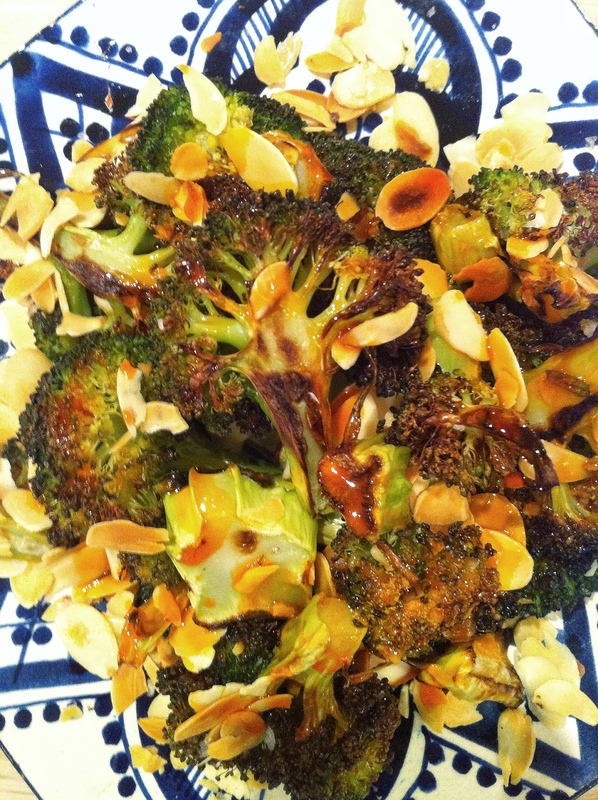 Pile the florets and almond flakes into a serving dish and drizzle over the dressing. You will not need all of it. 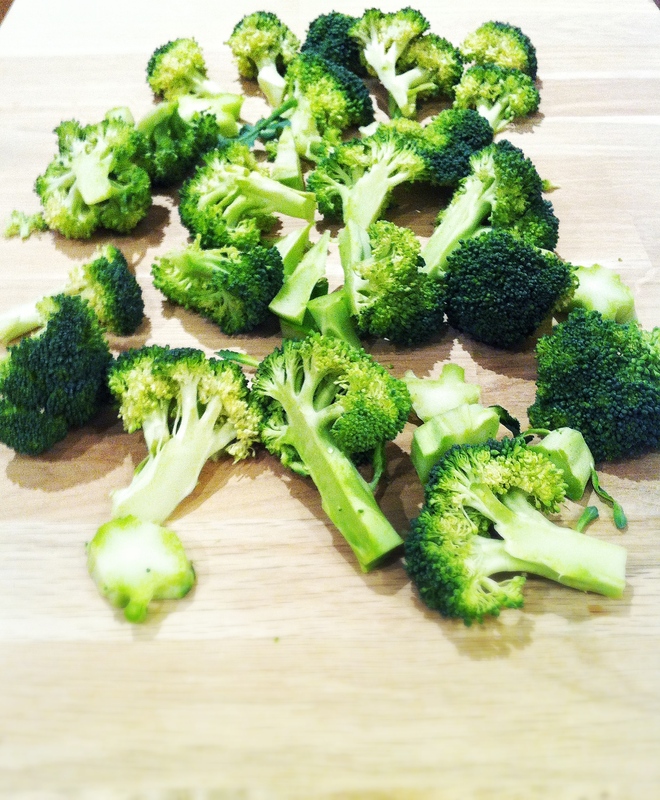 I used approximately 1Tbsp to dress one medium head of broccoli. 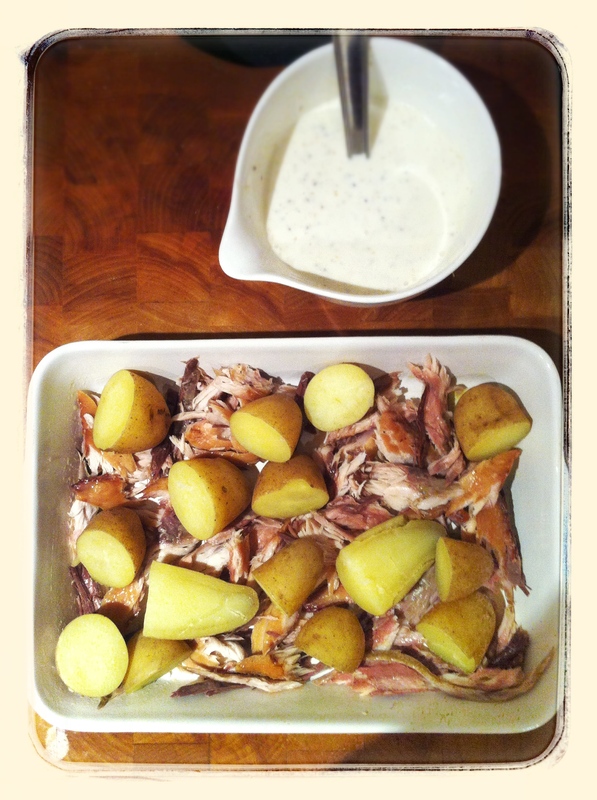 Left over dressing is a great marinade for chicken or fish and can also be used to perk up potatoes. A local Italian restaurant serves a seafood linguine al cartoccio and it is very easy to do as long as you undercook the pasta before it is parcelled. As far as flavours go, you could use tarragon instead of rosemary and a little sprinkle of crushed toasted coriander seeds would also be lovely. A little infused saffron would be delicious with rosemary and a mix of seafood. You could use other types of fish and seafood too but you may need more liquid and a little longer cooking time if the fish is thick. If you are making these for more than two people or for a dinner party (and this is a fantastic template for a dinner party recipe as you can prepare the parcels beforehand and then cook them 10 minutes before you want to eat) then, parcel up the fish individually. 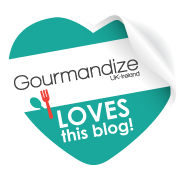 3 or 4 cloves of Garlic Confit or roasted garlic – don’t use raw garlic as the flavour will be overpowering. Pre-heat oven to 220C/425F. Put a roasting tray or sheet in to pre heat as well. 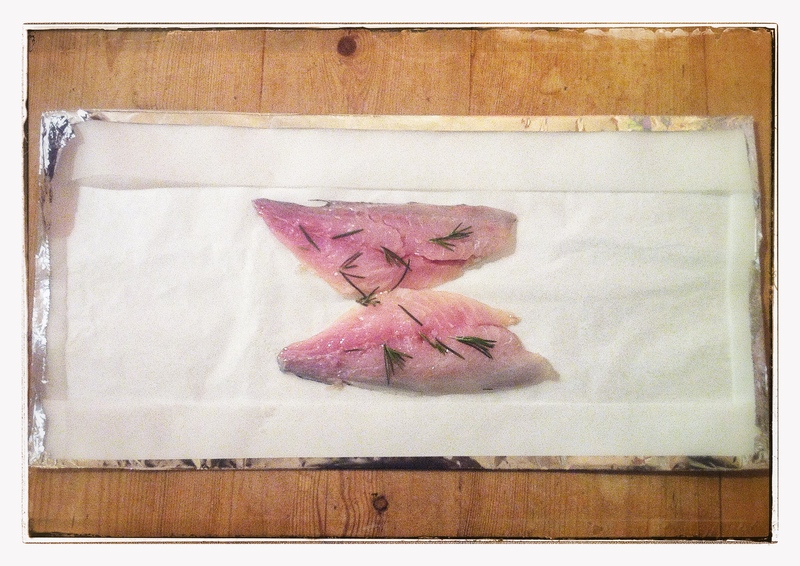 Make the cartoccio by placing the foil on the worktop, shiny side down. Lay the parchment paper on top and turn over the edges to seal the two together. Lay the fish fillets in the middle of the paper. 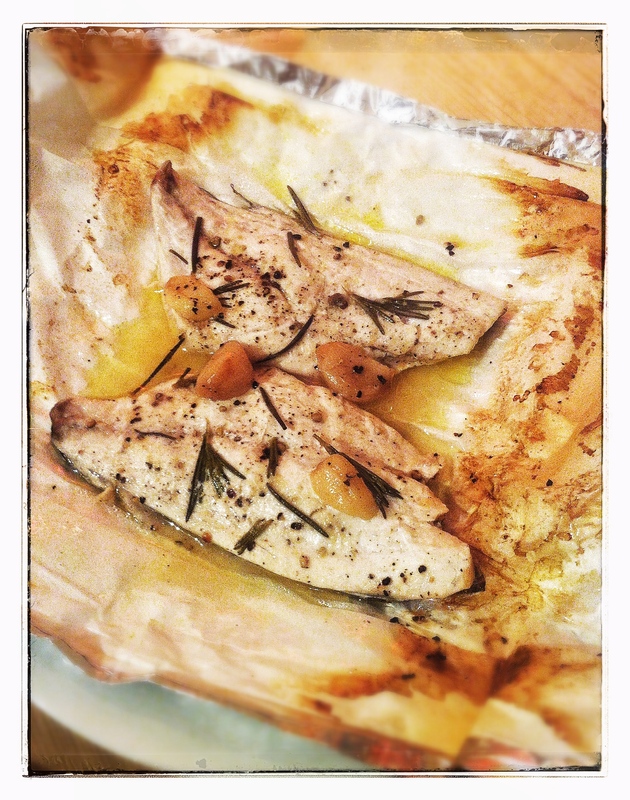 Season fillets with salt and pepper, scatter over the rosemary needles and garlic. Drizzle the garlic flavoured oil over the fish and top with the butter. Bring the short ends of the paper together over the top of the fillets and roll/fold up as tightly as you can manage so that steam cannot escape. There shouldn’t be too much space inside the parcel so make it as small as you can without crushing the fillets. Then, fold up one of the sides, again, as tightly as you can. Press down on the foil to help seal it. Tip up the open parcel slightly and pour in the wine. Seal this side tightly as well. You should have a small domed parcel that is a little larger than the fish inside. Place the parcel on the pre-heated tin and cook for 10 minutes. Let it sit for a couple of minutes before opening the parcel. 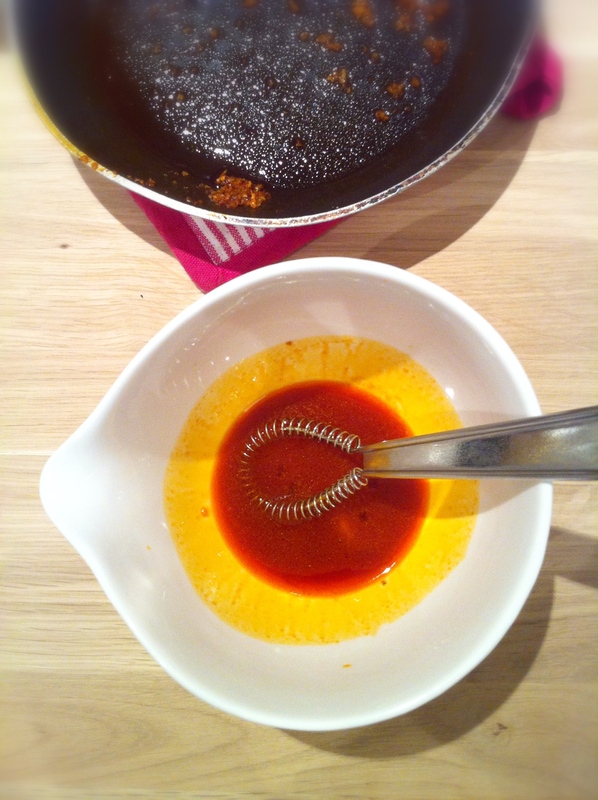 The wine, oil and butter will have combined to make a small amount of delicious sauce that should be spooned over the fish when you serve it. Delicious with Roasted Fennel and Cannellini Bean Puree and a green salad with a sharp dressing. 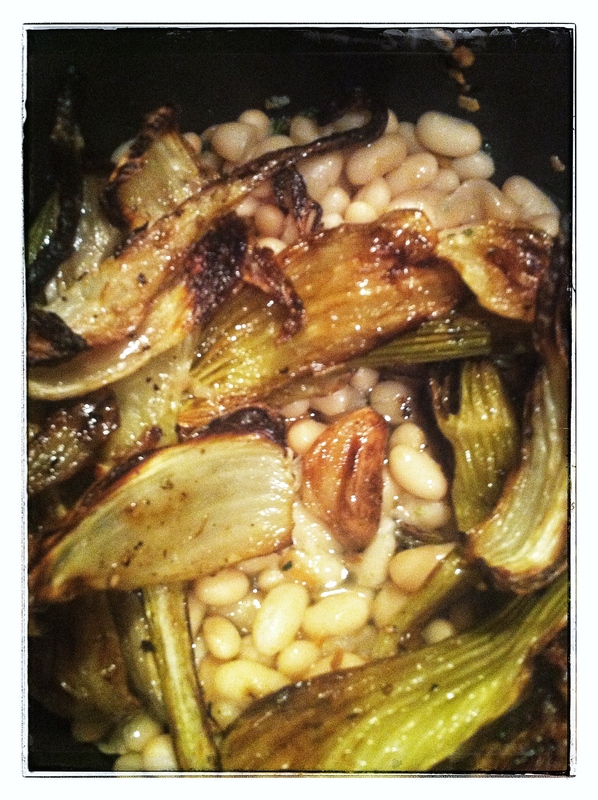 Marcella Hazan introduced me to the many delights of white beans when I first started cooking in the mid eighties. She has a recipe for “Zuppa di cannellini con aglio e prezzemolo” (Bean soup with parsley and garlic) in her Classic Italian Cookbook that is simply superb. Sadly this brilliant book is out of print now but can still be bought second hand though I am shocked that anyone would ever part with it! There are many recipes for white bean purees and this particular recipe has been inspired by a post in Food52 that I saw recently. The dish will not win any beauty contests but it tastes absolutely amazing and is perfect with a roast or a simply cooked piece of fish which is what we had it with last night. The depth and complexity of flavours depends on cooking the ingredients fully and carefully before pureeing so don’t skimp on turning the fennel pieces over 3 or 4 times and watch the frying garlic as it goes from perfectly golden to burnt in a few seconds especially as it continues to cook in the hot oil when you take it off the heat. 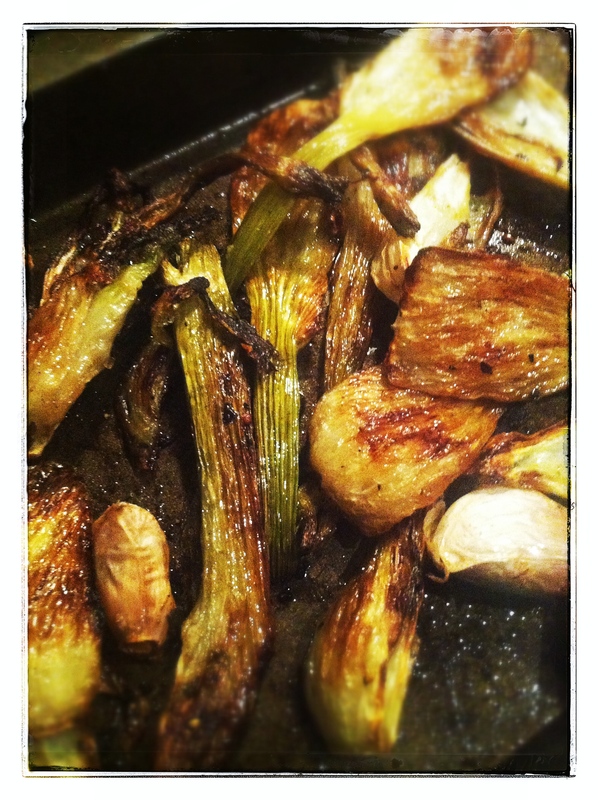 I have to say that the roasted fennel is absolutely delicious on it own too so feel free to make more that is needed for the puree if you want to have it as a vegetable side. Scrape out mixture into a baking dish and sprinkle with chilli flakes and fennel seeds before sprinkling on the remaining parmesan cheese. Delicious and ready to eat if not winning any beauty contests! 2 small fennel bulbs, trimmed and cut into quarters. They will fall apart but that is okay. branch of vine cherry tomatoes as long as they are tasty! Closely trim the bottom of the fennel and trim the ends off the tops as well. Halve and then quarter the pieces, bearing in mind that they will fall apart. 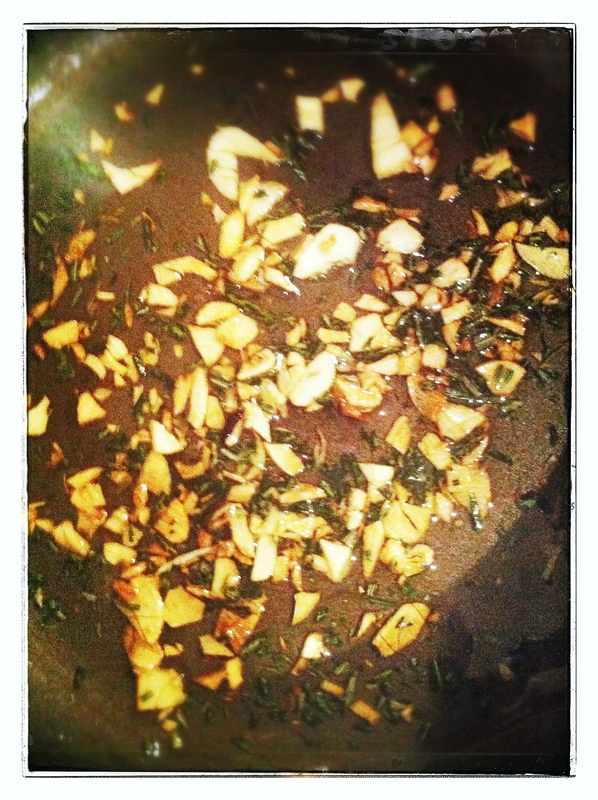 Place in a roasting tin with the unpeeled cloves of garlic and dribble over the oil. 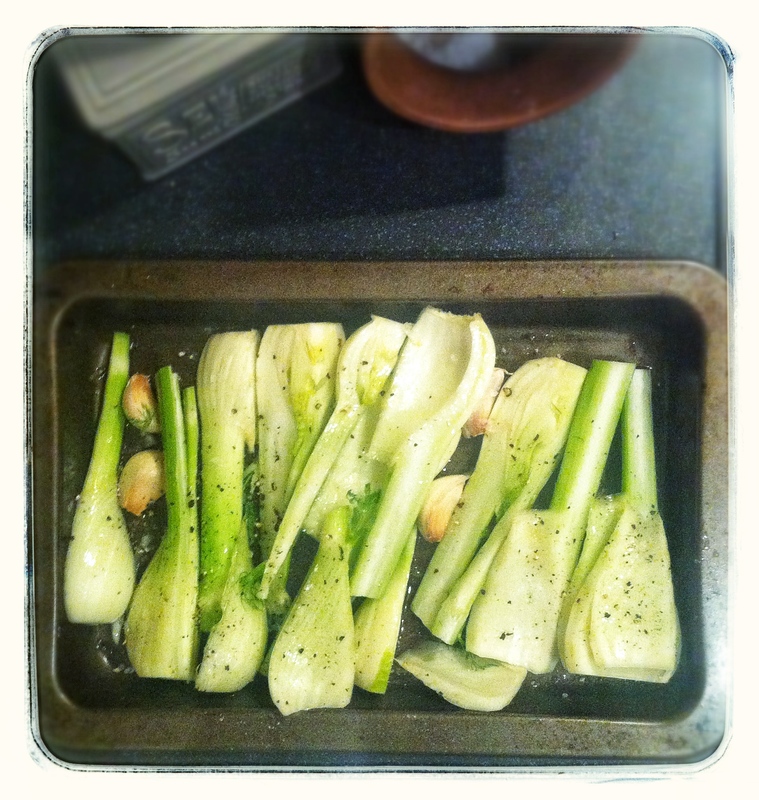 Using your hands, gently toss the fennel in the oil so that it is all coated. Season with salt and pepper and roast in the oven, for 30-40 minutes, checking every ten minutes to turn the pieces over. I find a that a timer helps here. Stop when the pieces are soft and golden. Cooking it this way drives out a lot of the moisture, concentrating that aniseed flavour and you will find that they shrink down quite a lot. In the meantime start the cannellini beans; pour the oil into a saucepan and heat gently. Add the chopped garlic and cook until nicely coloured. Watch it like a hawk as you get near the end as it will catch really easily, burning and turning bitter. 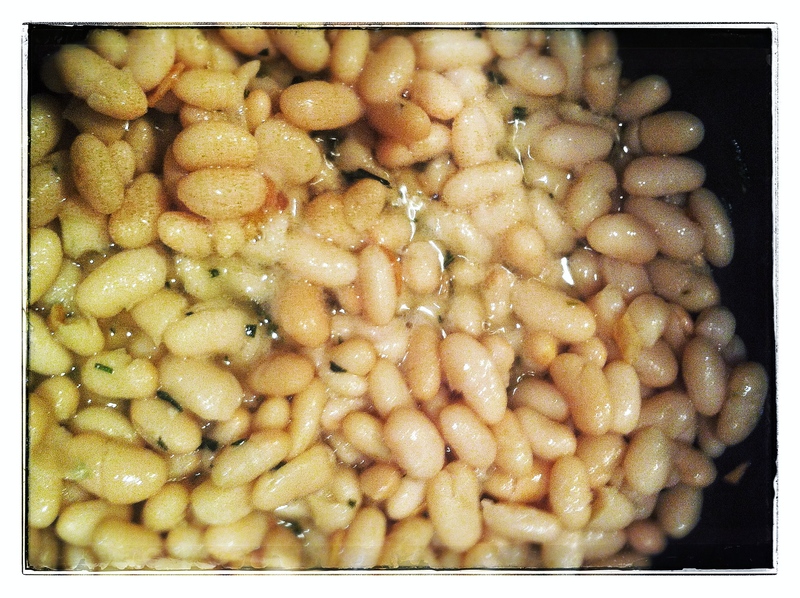 Add the rosemary and then stir in the cannellini beans and the lemon juice and let it heat through. 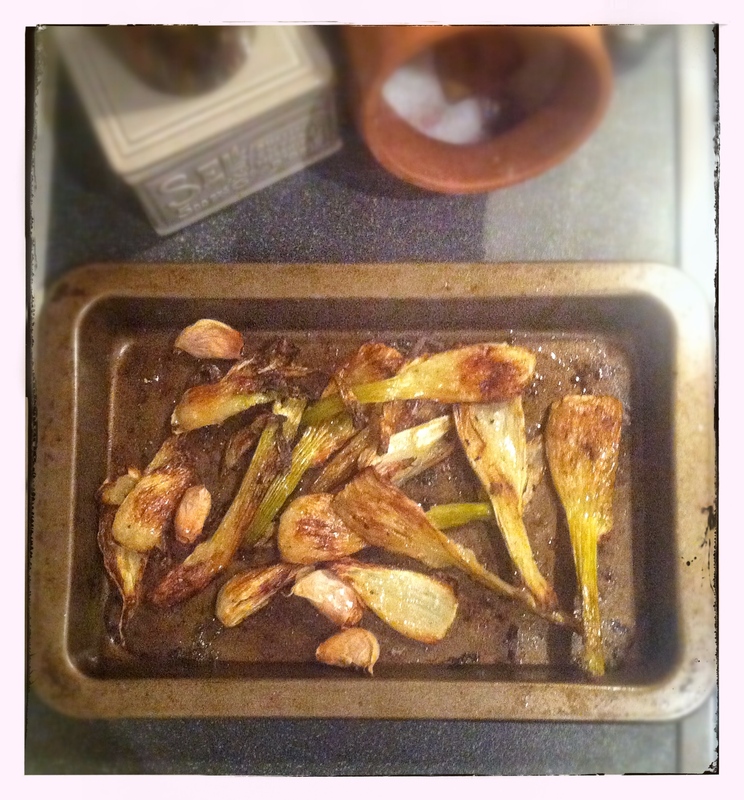 Take off the heat and set aside until the fennel is ready. Once the fennel is cooked turn the oven up to 220c/425F and stir fennel and peeled garlic cloves into the bean mixture along with the lemon juice and most of the parmesan cheese – reserve 2 or 3 Tbsp of cheese for the topping. I used a stick blender to puree the mixture but you could also use a food processor. Taste the puree and adjust the seasoning to your taste. If it is too thick, add a little water to loosen it up remembering that the texture should be like mashed potatoes. 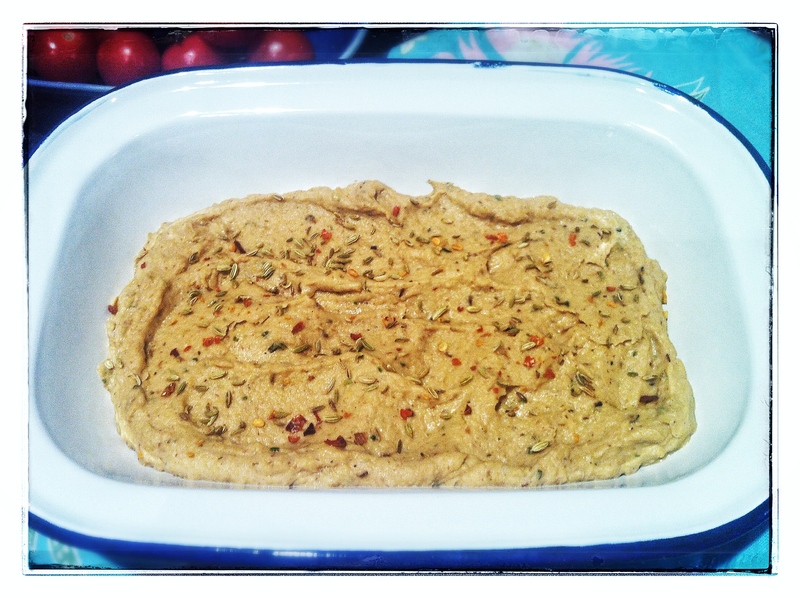 Scrape it into an ovenproof dish and sprinkle over the chilli flakes, fennel seeds and remaining parmesan cheese. Place the vine tomatoes on top if using. Dribble a little oil around the edges too. Cook for 15 minutes and serve immediatley. 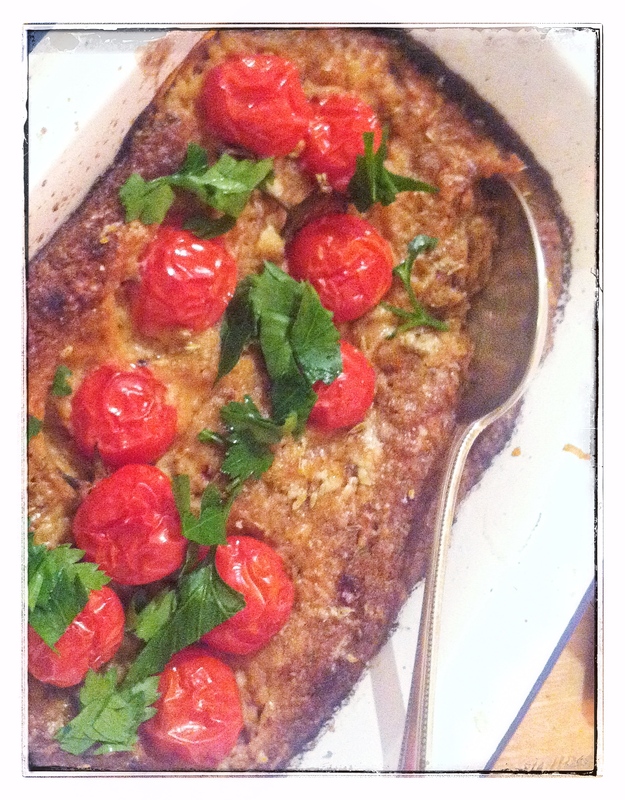 I see from my notes that I have been making this Smoked Mackerel Gratin for nearly 10 years now. I first made it because I wanted to introduce more of those Omega-3 fatty acids into our diet and it was such a hit with J who would have been 6 years old at that time, that I have been making it regularly ever since. 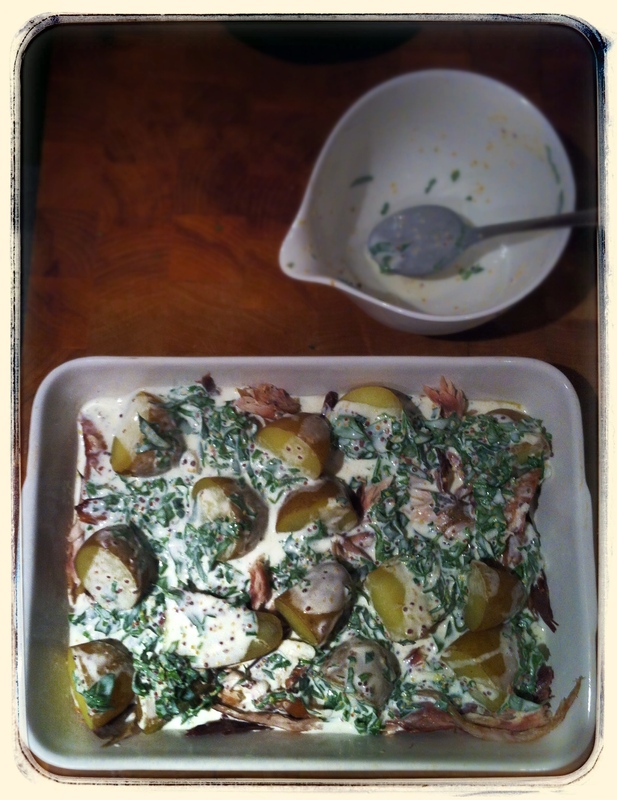 Smoked fish and cream is a food marriage made in heaven. With the addition of potatoes, mustard and herbs this dish becomes a quick, intensely savoury, mid-week meal which only needs a sharply dressed green salad, cutting through the richness, to round it off. Intensely savoury, smoky, and creamy deliciousness. You could add a scattering of halved cherry tomatoes before covering it with cheese and you could also add a layer of fresh spinach leaves (which you have run under a tap to make wet) under the fish in which case you should increase the milk by about a 1/4 cup. 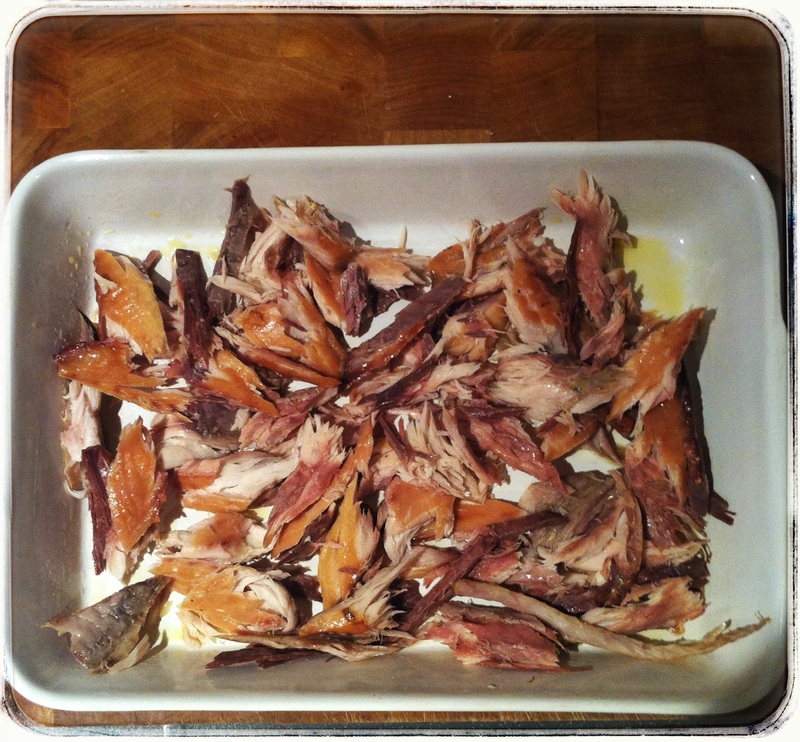 The smoked mackerel is quite salty as is the cheese so you shouldn’t need any additional salt. A little butter or oil to grease the oven proof dish. Preheat the oven to 200C/390F and lightly grease the oven proof dish. Place potatoes and garlic in a saucepan and cover with cold water. Bring to a boil then simmer for 10 minutes. The potatoes should give way to a knife but not be falling apart. Drain and remove the garlic. 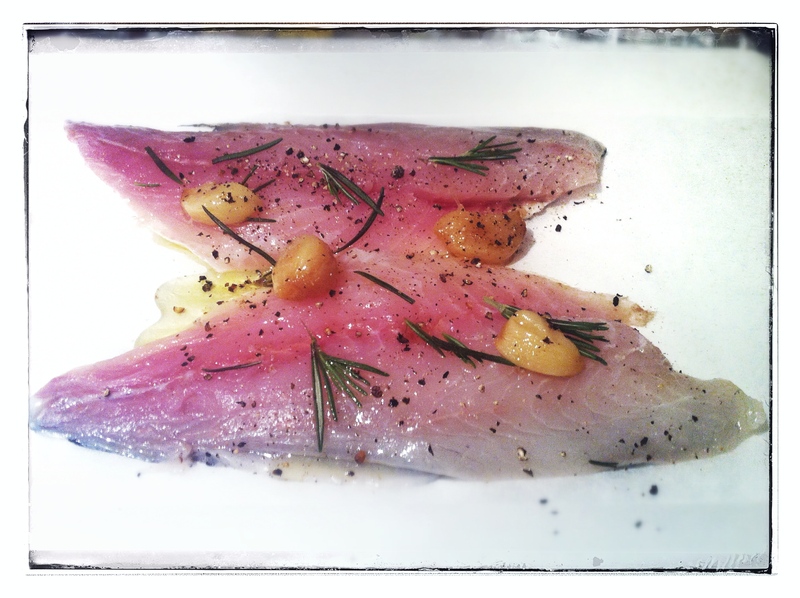 Peel off the skin and flake the mackerel into the dish, carefully pulling out any bones which have been left behind. Leave the fish in quite large chunks if you can. 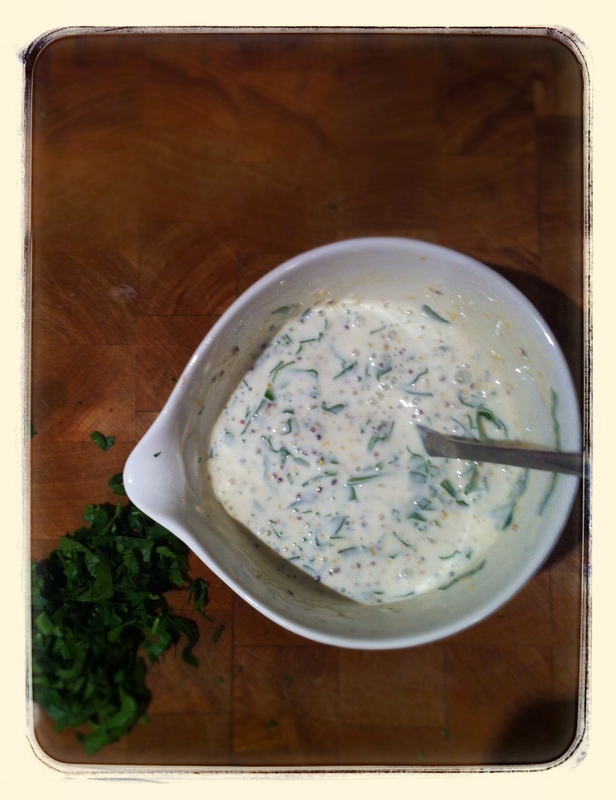 Whisk the creme fraiche then stir in the mustard and whisk again. 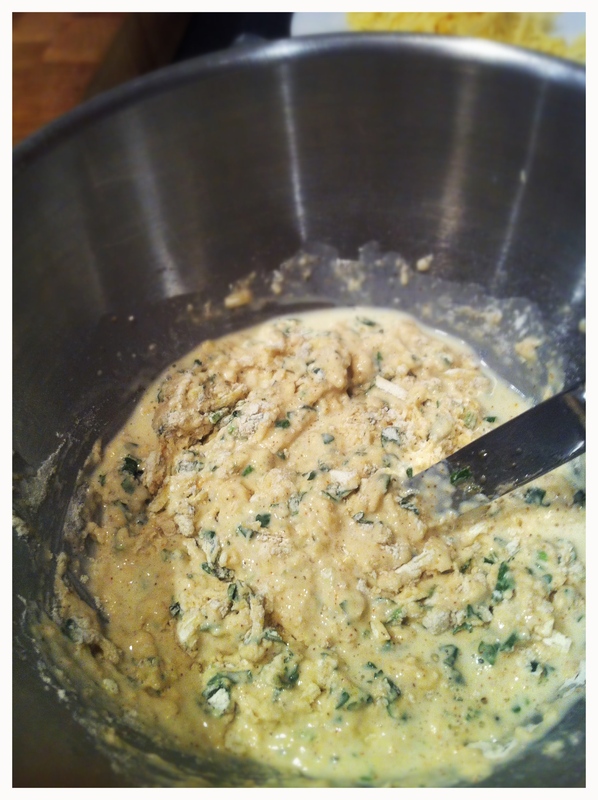 Mash in the soft garlic and slowly whisk in the milk and stir in the herbs. Cover the fish with the hot potatoes, then pour over the crème fraîche mixture and top with the grated cheese and a grinding of pepper. 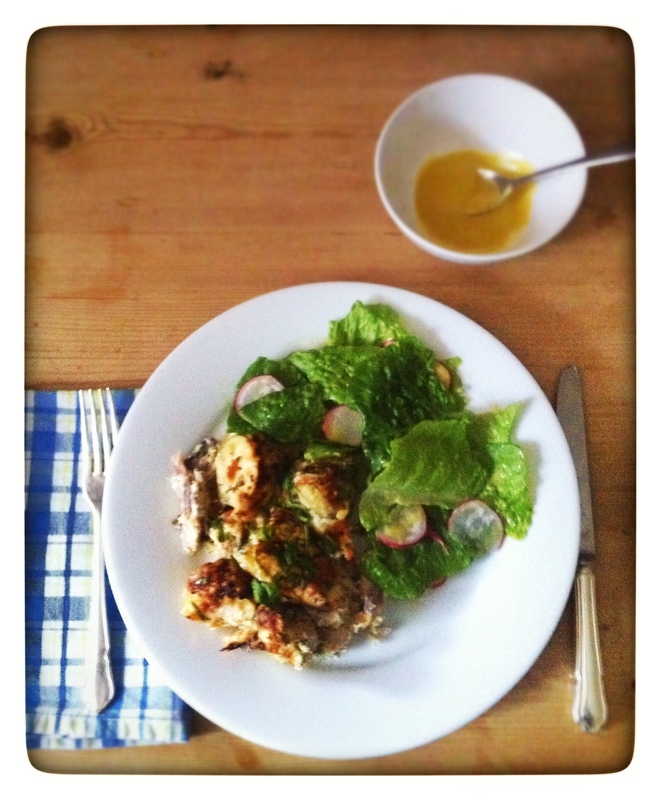 Serve with a mustardy dressed green salad and some crusty bread to soak up the delicious juices. And it was so beautifully photographed by the amazing James Ransom too! Lots of lovely comments and helpful tips in the comment section as well. 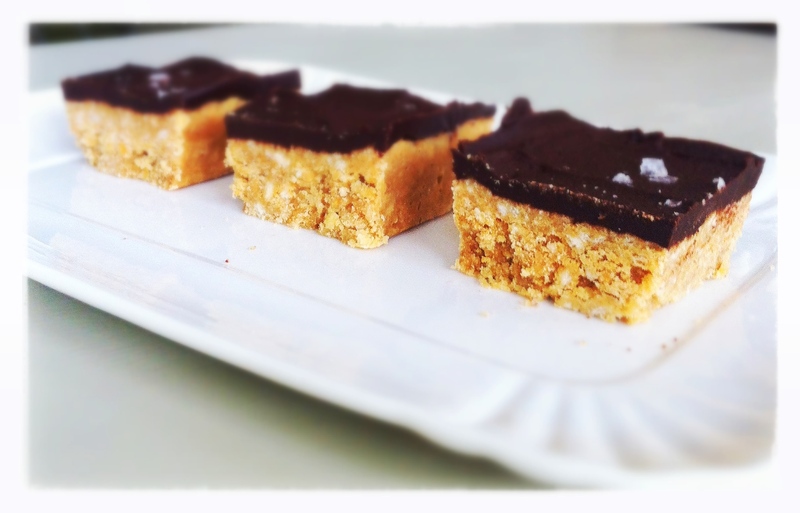 These Peanut Butter and Chocolate Squares are really quick to make and are delicious pick-me-up with a mid-morning espresso. I think that they would be rather lovely with a glass of milk too. 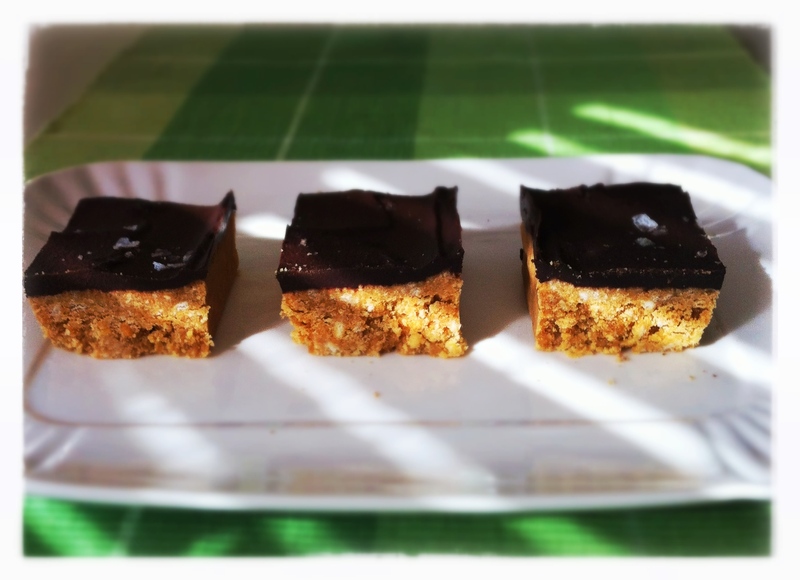 They are not too sweet, with that unmistakeable savoury peanut butter flavour; chocolatey with a little hit of salt. 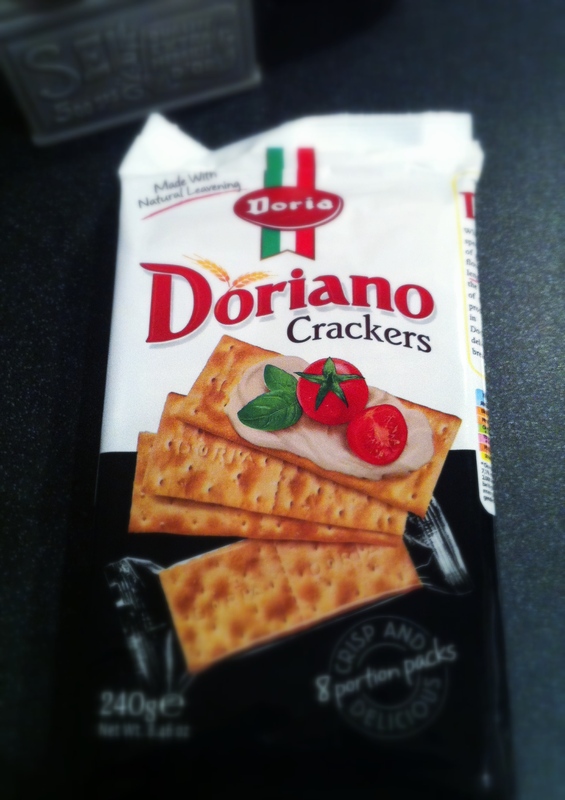 The body is given by the Saltines which are an American cracker with a light sprinkling of salt on them. 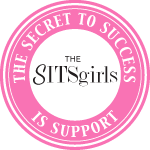 Saltines are very dry and very crisp – in fact a Saltine Cracker Challenge exists, to eat 6 crackers in one minute without any water – easy to crunch up but very hard to swallow! I remember getting them, wrapped in their cellophane with a bowl of soup at The Hudson’s Bay in-store diner where I used to escape to during my lunch hour when I worked in retail. Saltines are available to buy on-line in the UK here but if you don’t want to wait, I have found that Sainsburys sell an Italian version called Doriano which is what I used for this recipe. 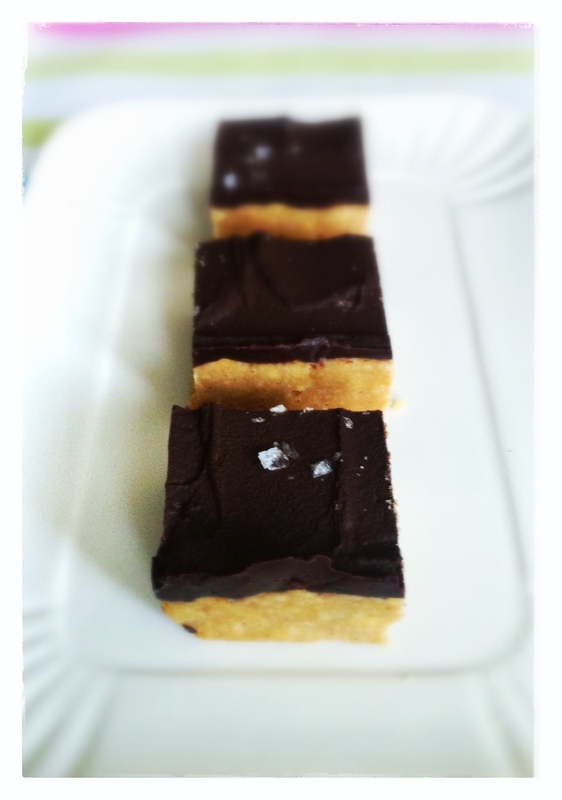 Bookmark my recipe for Peanut Butter and Chocolate Squares, for the festive season if you have a peanut butter loving friend; popped into one of those cellophane bags, this makes a lovely gift with the added bonus of being quick to make during the time constrained weeks leading up to the big day! 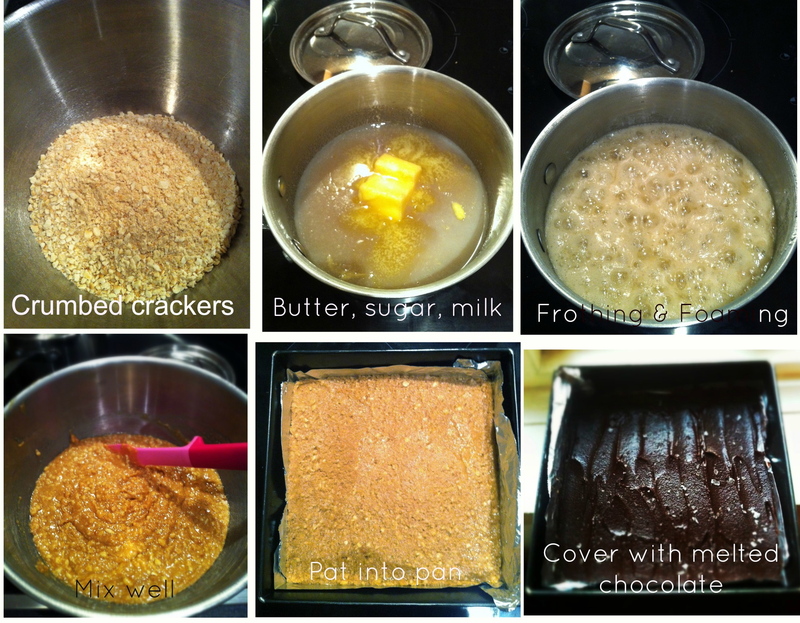 These are so simple to make; blitz the crackers, melt the butter with the sugar and milk; pour onto crackers and peanut butter; mix and pat into a pan; cool, then cover with melted chocolate and sprinkle with flaky salt. Line a 9 inch square pan with parchment paper or non-stick foil. I have a really easy way to do this in Tips and Tricks – in the baking section. Leave a little overhang so that you can pull up on it later. Blitz or crush the crackers into fine crumbs, depending on how much texture you want in your squares. Doing this in a food processor took me about 2 minutes, pulsing for the last 30 seconds to check on progress. Empty into a large mixing bowl then scrape out the peanut butter and dump it on top of the crumbs. Place the sugar, milk, and butter in a saucepan over medium low heat, stirring from time to time. It needs come to a boil slowly. Once it comes to a full boil, set the timer for 1 minute. The mixture will froth and foam so don’t panic and take it off the heat. When the minute is up, carefully pour the extremely hot sugar mixture over the crackers and peanut butter. Add the vanilla and then stir with a spatula until it is really well combined. Scrape it into the prepared pan, pat it in and smooth it out and leave it to cool for about an hour. Slowly heat the cream in a pan until it just comes to a boil. Take it off the heat and stir in the pieces of chocolate. Stir until the chocolate has melted and it’s all looking lovely and glossy. Pour onto cooled peanut butter mix and cover, using a spatula to even it out. Sprinkle with sea salt while the chocolate is still warm. Pop into the fridge to allow it to set, then remove from the tin and using a large knife, cut into 16 squares or whichever size you like. During my early school years, my father would collect me at lunch time, to go home to eat a delicious meal around the dining table, all of us together, before he dropped me back and carried on his way to work. This was in the days before Nairobi became so congested with traffic and people so as to make it impossible to go anywhere quickly. When I started secondary school, for reasons that are not clear to me now, I was signed up for school lunches. After a week of leathery grey slices of meat in thick brown gluey gravy, grey mushy vegetables and claggy puddings with skins on them, I told my mother that I thought pork was being served and that of course I wasn’t touching it so I wasn’t eating a thing and therefore starving in the afternoons. The double whammy of forbidden meat and a hungry tummy had exactly the effect I had hoped for. No more inedible food in the smelly dark dining hall but glorious packed lunches eaten under the trees in front of the school tennis courts with my friends. Our cook, Migaleh, had come to work for us via some ambassador’s house and would cook the most scrumptious “european” food – roasts, chops, steaks, chips, sausages, mashed potatoes, omelettes – for me and my brother at tea time. Now he was making me a thermos of hot chunky chicken soup or thick roast beef or chicken salad sandwiches to take to school…oh how I pitied those boarders trapped in the dining hall with the nuns as we sat in the sunshine shaded by the Jacaranda trees! I was reminded of this today as I shopped for after school snacks. School has begun; the children are off the streets and out of the shops and can now be seen looking tired and despondent in their school uniforms on their way home for tea. It is difficult to get back into a routine in those first couple of weeks but all too soon the summer holidays will be but a distant memory as the unrelenting schedule of early mornings, lunch boxes, sports practices, clubs and societies, music practice, homework and a regular bedtime establishes itself. Until half term that is. 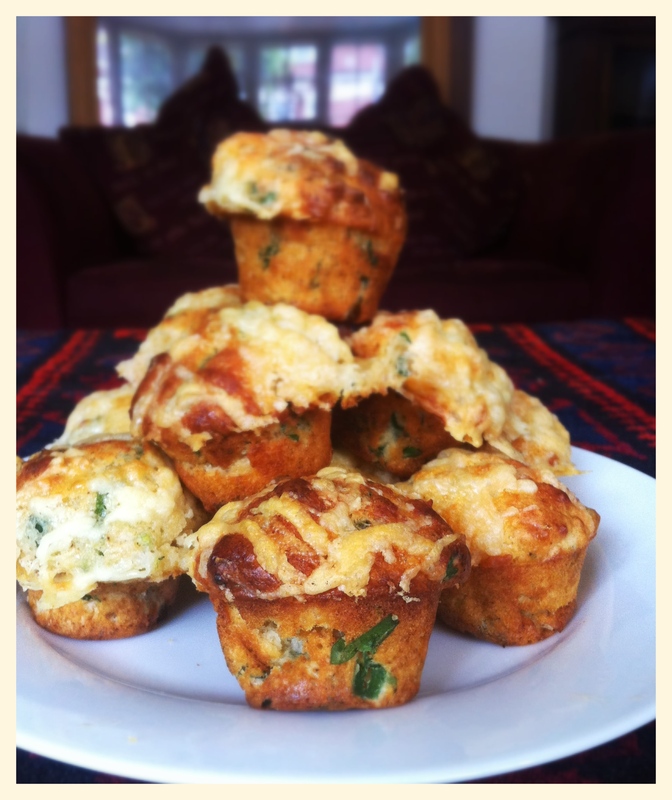 My friend C alerted me to this recipe for cheese muffins from a wonderful New Zealand book of traditional home baking compiled from old community cookbooks by Alexa Johnston, called Ladies, A Plate. I found great pleasure in reading the stories that hark back to “a gentler time” which are attached to many of the receipts. 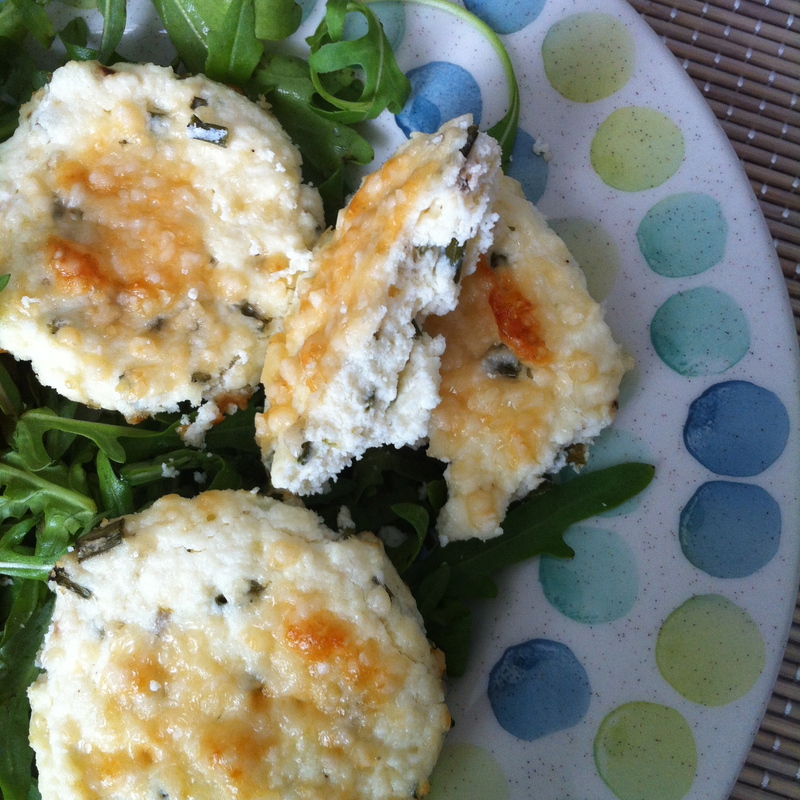 C sometimes makes these for her packed lunches and once I had a taste, I was smitten! I make these quite often as they come together very quickly and it’s just so handy to have a few stashed in the freezer. They are incredibly quick to make. 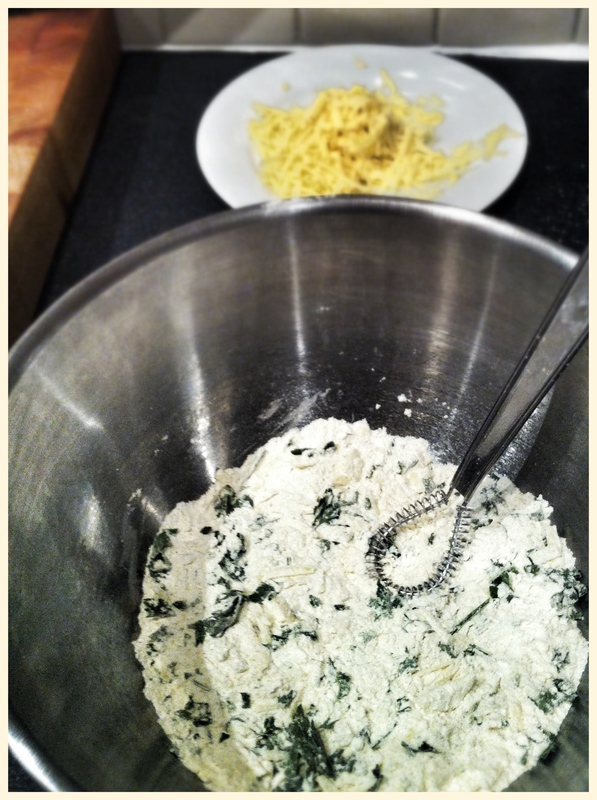 Measure out the dry ingredients into one bowl and use a whisk to aerate and mix at the same time. I’ve substituted bouillon powder for the salt for a more savoury flavour. 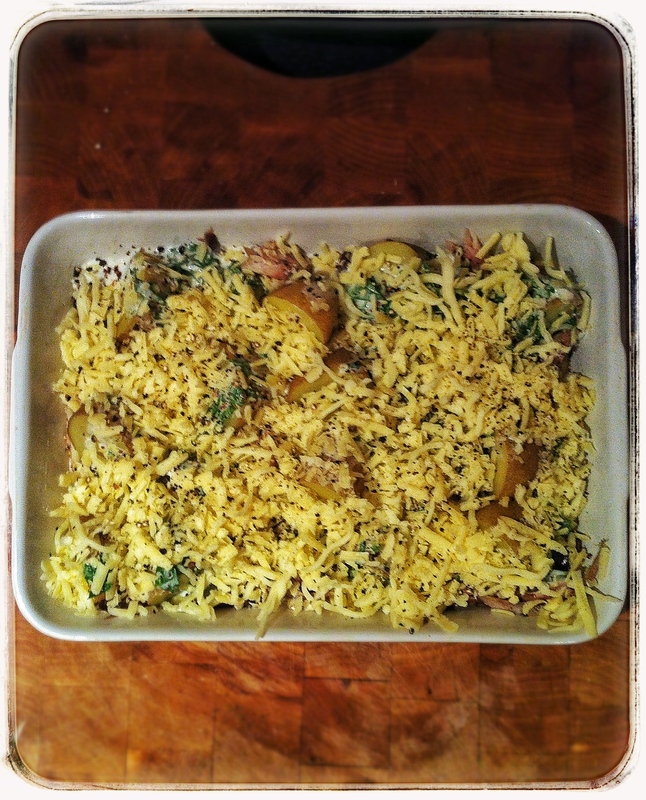 Then, add the parsley and about 2/3rd of the grated cheddar cheese and mix again to coat the cheese. Pour the wet ingredients into a measuring jug and whisk. 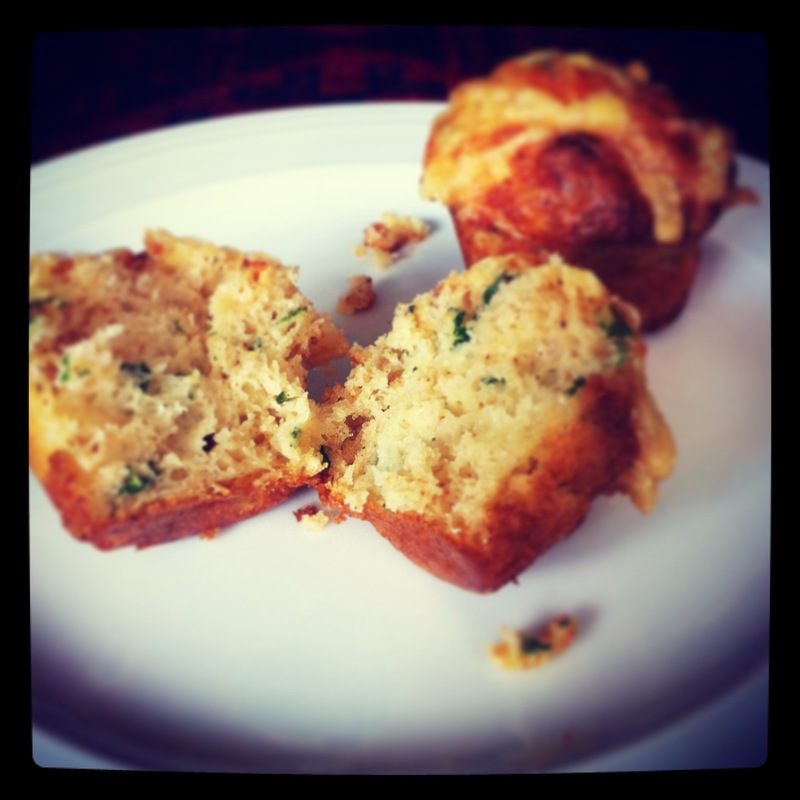 Gently add to the dry ingredients and mix very lightly until it has just about incorporated – don’t overwork the batter otherwise the muffins will be tough. It’s perfectly alright if there are some tiny pockets of flour visible. Grate some parmesan using the coarse side of a box grater to get lovely long pieces of cheese rather than the finer more powdery output that is usual. Divide as equally as possible among the cups of a 24 mini muffin pan (which have been very well greased, hopefully with a saved butter wrapper). 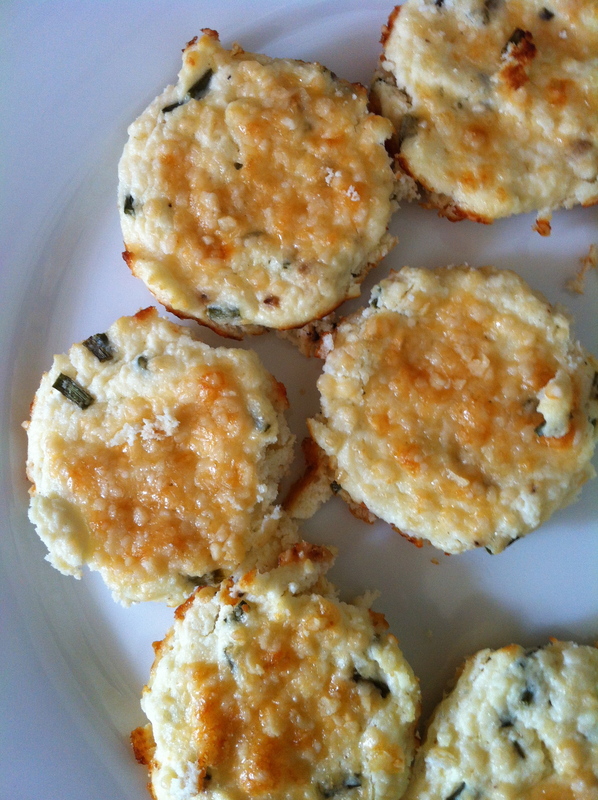 Use a dessert spoon and a rubber spatula to fill the cups and then top with the two cheeses. 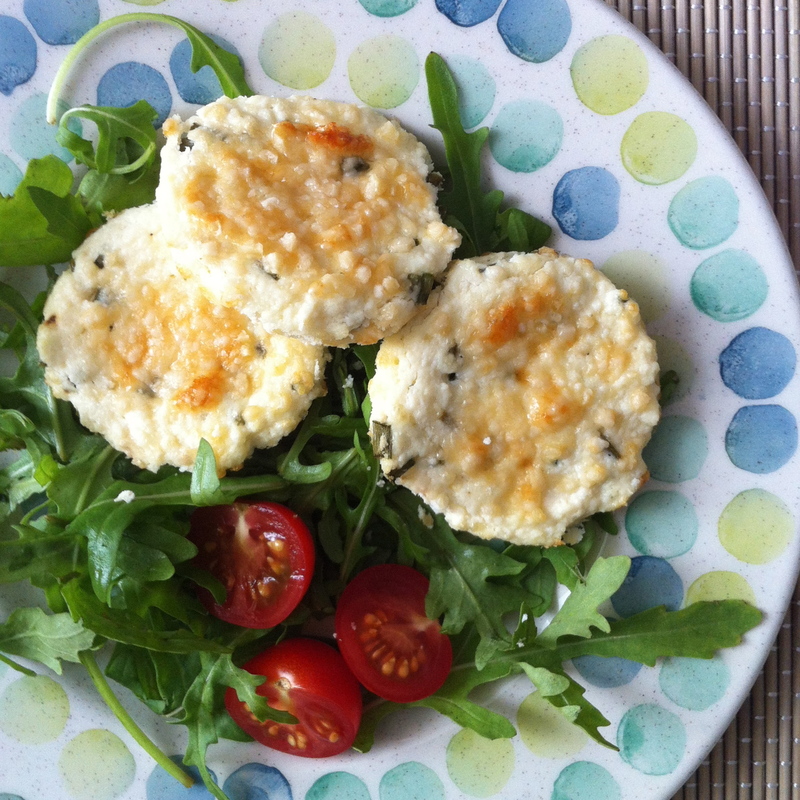 I am submitting this recipe for September’s Cheese, Please! 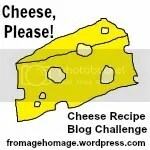 Recipe challenge as hosted by the informative and delicious blog Fromage Homage. 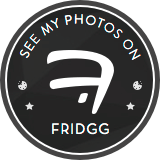 Do go over and take a look at what she’s been up to – cooking with cheese, tasting it and travelling for it and making her own cheese. And she’s a mother – I am in awe! 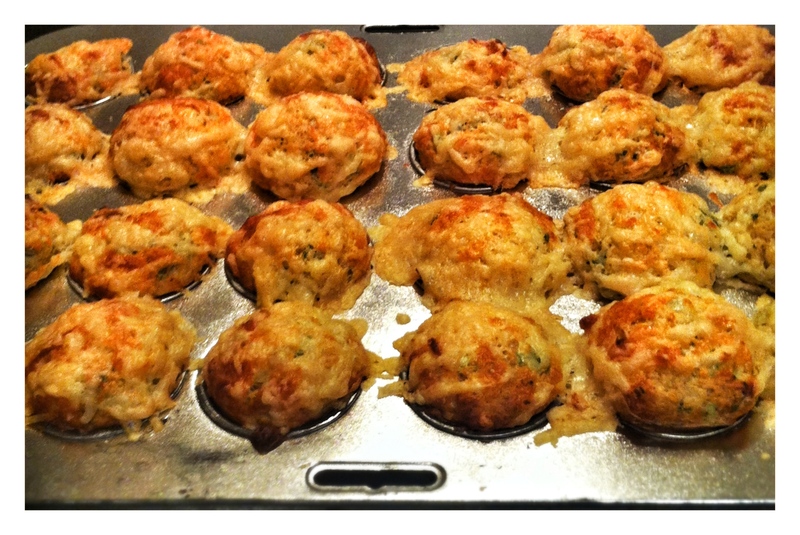 Preheat oven to 190C/375F and thoroughly grease a 24 cup mini muffin tin. 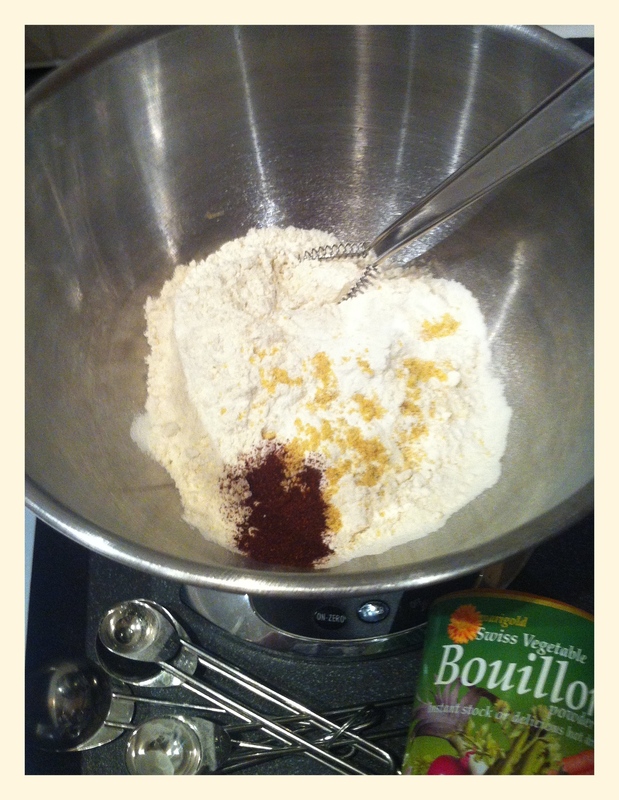 Measure out the flour into a medium size mixing bowl; whisk in the baking power, bouillon powder or salt and the cayenne. The salt either in the bouillon or itself is important as it activates the baking powder when the wet ingredients are added. Stir in the chopped parsley and 2/3rds of the cheddar cheese with a table knife, coating all the cheese and parsley with the flour mixture. 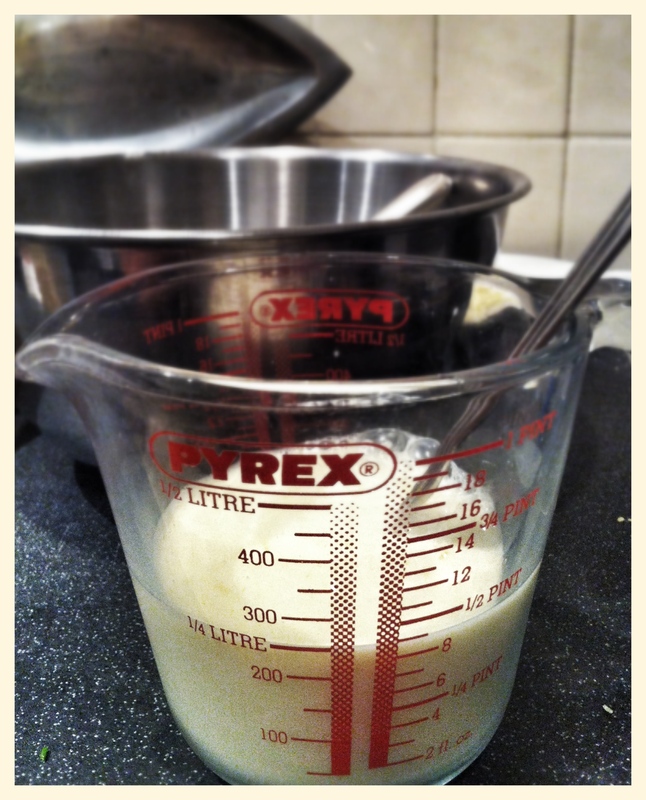 Pour the milk into a measuring jug, crack the egg into it and whisk together. 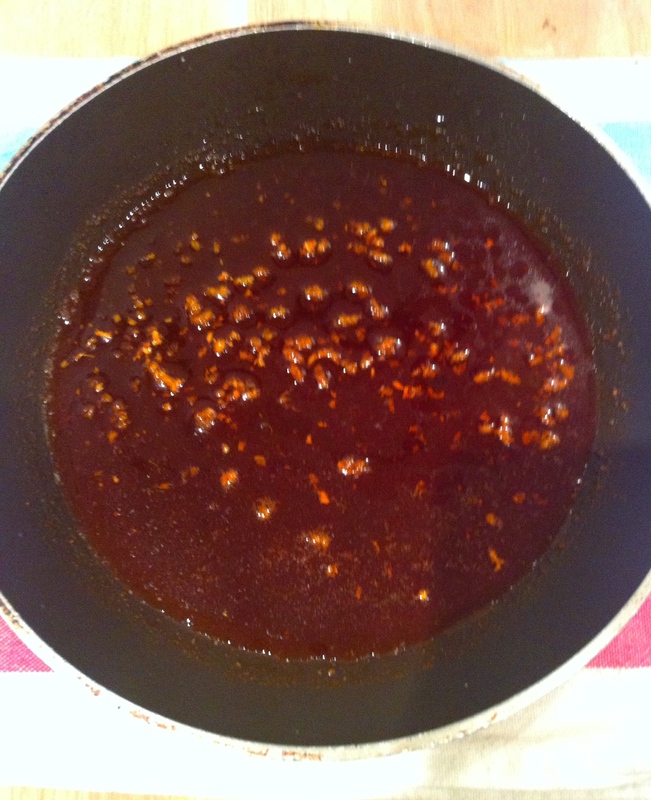 Pour the wet ingredients onto the dry and mix gently with the table knife until it is just combined. Don’t overwork the batter. 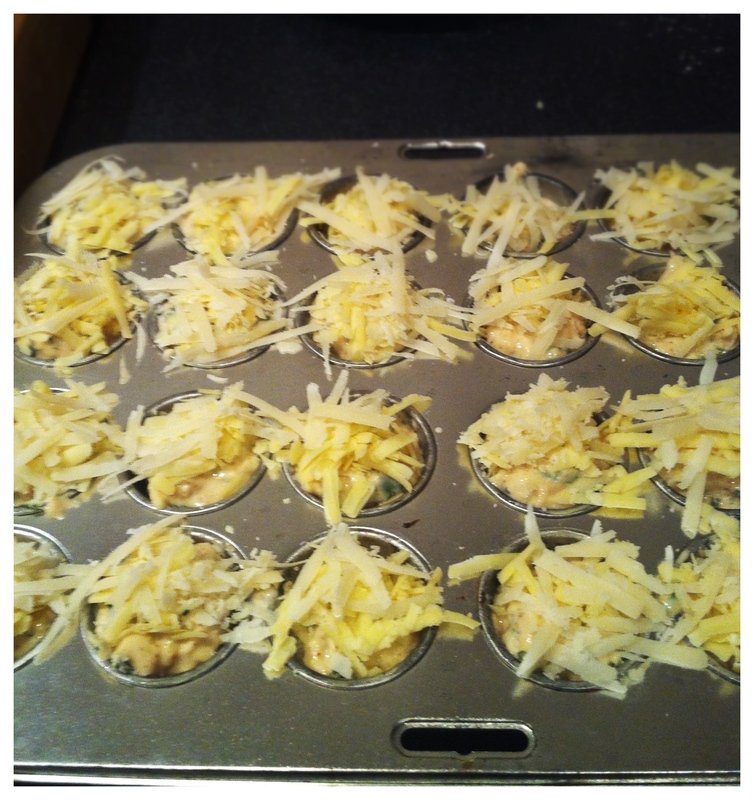 Spoon into 24 mini muffin cups as evenly as possible. 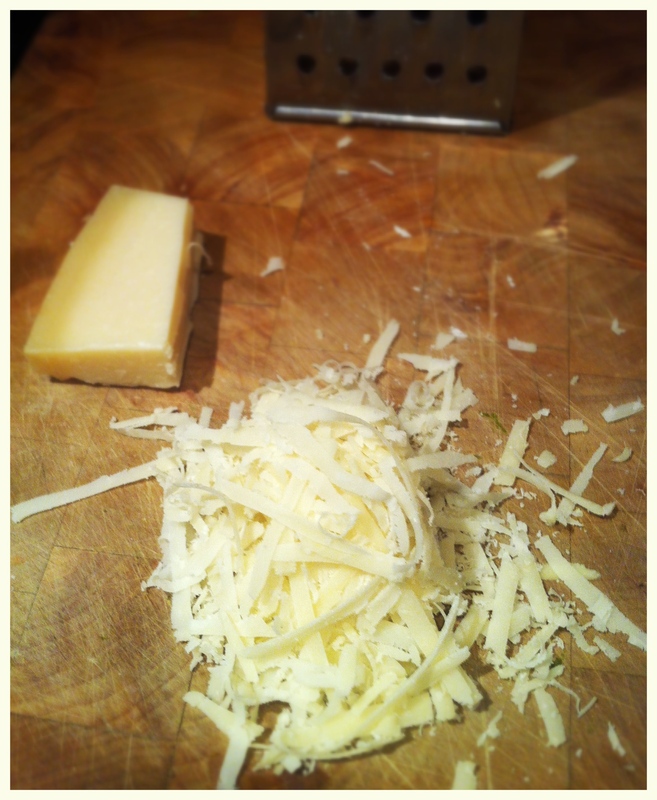 Top with the reserved cheddar and then with the parmesan. Bake for 10-15 minutes until golden brown and crispy. Remove to a wire rack to cool. They should pop out really easily. 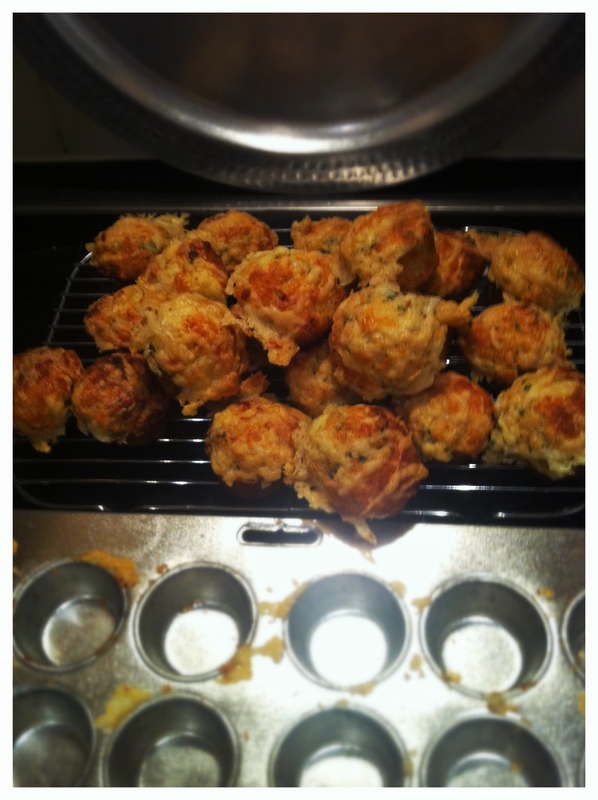 These are best, greedily devoured, warm of course but are delicious cold. They freeze well and are ideal to pop into a lunchbox where they will have thawed out by the time you are ready to eat. Lovely with soup or as a rustic nibble with drinks! -Replace parsley with a couple of tablespoons of finely chopped sundried tomatoes and/or olives and one tsp of very finely chopped rosemary or dried oregano. Replace the cheddar with crumbled feta or goat’s cheese.